The Spurs shot just 38 percent from the floor in a 95-88 loss. The Silver & Black made a nice run late, but their deficit was too large to overcome. The result: a second straight loss for San Antonio. The Spurs shot just 38 percent from the field, thanks in part to the rim protection from Miami's Hassan Whiteside. The center led all scorers with 29 points and his 20 rebounds were also a game-high. He blocked 8 shots in the first half and finished with 9 rejections. The Spurs were led by Patty Mills' 20 points and David Bertans, who added 19 points on 4-of-7 shooting from deep. Both of those players came off the bench for the Spurs. LaMarcus Aldridge finished with just 6 points on 2-of-14 shooting, his lowest output of the season. 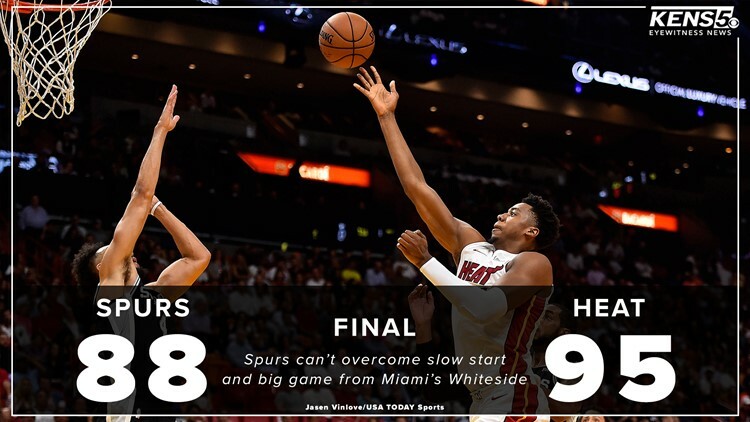 Hassan Whiteside continues to abuse the Spurs. He is currently at 27 points, 17 rebounds and 8 blocks. Derrick White did not start the half, which is probably a good decision since this is not a good matchup for him. White loves to drive off pick and rolls and thanks to Whiteside, that is just not possible. Patty Mills is really the only consistent offensive option thus far. DeRozan and Aldridge are a combined 7-for-23 from the field with 18 combined points. That's just not going to do it if San Antonio wants to win ballgames. Luckily for San Antonio, Whiteside is the only bright spot for Miami so the team is still very much in this thing with one quarter to go. Derrick White is not having a banner night in his return to action. Just can't get anything going offensively. He's approaching 20 minutes of action with 0 points. Patty Mills has a new season high with 17 points halfway through the third quarter tonight. At halftime, the Spurs trail 50-42. The Spurs just can't score tonight, shooting under 30 percent from the floor with about 5 minutes to go in the first half. Miami's Hassan Whiteside slowed down, but is still on pace for a rare points-rebounds-blocks triple-double. Patty Mills has 6 field goals at halftime - most he’s ever had in a first half off the bench in his Spurs career. After one, the Heat lead the Spurs, 27-20. Where's the 'restart' button? The Heat raced out to a double-digit lead in the first 5 minutes. The hosts kept it there for much of the period, thanks to the play of their center, Hassan Whiteside. Whiteside notched 10 points, 7 rebounds and 5 blocks in his first 8 minutes on the floor. If the Spurs can't get him in foul trouble and he stays on the floor at this level of production, it'll be a long night. In a one-game trip away from home, the Spurs have a chance to get back in a groove following Sunday’s loss. The Spurs dropped a 117-110 contest to the Orlando Magic in San Antonio, snapping a four-game winning streak. The Spurs come into the game with a 6-3 record, while the Heat are 4-5. Both teams have plenty of veteran talent on the roster, but many of those guys won’t play Wednesday night. Pau Gasol and Rudy Gay are out for San Antonio, while Miami will be without Dwyane Wade and possibly guard Goran Dragic. The Spurs are expected to have guard Derrick White back for his first appearance of the season. White has been battling a left heel injury since the end of the preseason. Follow our live blog here, where we'll provide regular updates featuring highlights and analysis.